Ranking all 61 Super Bowl QBs: Where do the LIII participants fall? 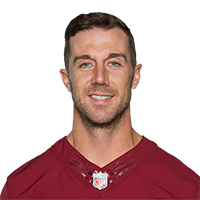 Published: Nov. 4, 2018 at 02:14 p.m.
Washington Redskins quarterback Alex Smith avoids a sack and scrambles for a 22-yard first down. Published: Oct. 28, 2018 at 01:37 p.m.
Washington Redskins quarterback Alex Smith finds running back Adrian Peterson in the end zone for a 7-yard touchdown. It's Peterson's first receiving touchdown since the 2013 season.